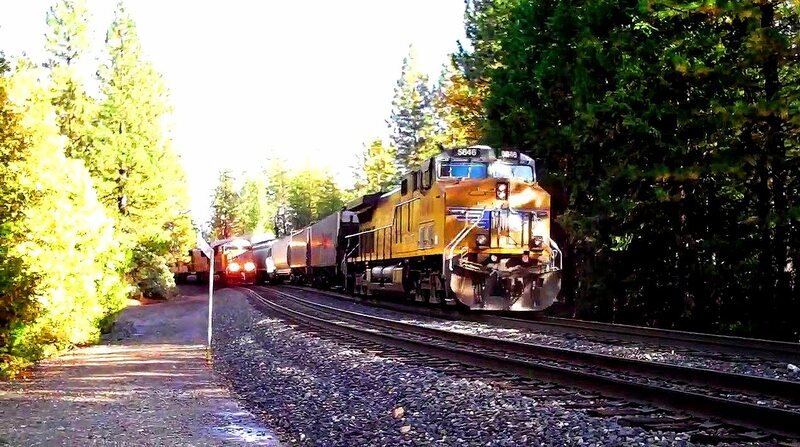 In a still from the video, UP 5646, a Distributed Power Unit (DPU or "dupe") pushes in Run 8, sanding like crazy (watch the video as this unit passes) as UP 3798 West rounds the curve from the left, in time for a perfect locomotive-to-locomotive train meet. Again, this HD Flip Slide video is best enjoyed fully expanded in YouTube, and with headphones. I followed UP 7732 East up from Colfax, and decided I'd try to capture it from a long, distant curve to a straight at an open crossing. I had yet to purchase my Flip HD with image stabilization, and instead shot this on a Flip Slide HD cam, which has a small tele option. I'd not used it before, and decided to "zoom" slightly to capture the initial approach. As you can see, this was a pretty bad idea, as the Flip Slide doesn't provide an actual optical telephoto option (small as it is), but instead uses the cheaper route: it merely enlarges the pixels and blurs the image. My bad. On point is UP 7732, a 2007 GE C45ACCTE with 4,000 hp. In second position is UP 2492**, a 2009 SD59MX with 3,000 hp (more on this unit later). Third in line is UP 9445, the elder statesman of the group, a 1991 GE C41-8W with 4,135 hp. The train itself is a mixed manifest. Pushing at the rear is UP 5646, a 2004 C44ACCTE with 4,390 hp. As this unit passes, note the brown swirl as the sanders work heavily. Clearly, the train has slowed down and all locomotives are maxed in Run 8. At the 5:00 mark in the video, directly after I had panned left to capture the passing DPU, UP 3798 West comes into view, the engineer hitting its K5LLA dual-chime air horns for the unprotected crossing where I'm standing. Heading downhill on the #1 track, UP 3798 West is, these days, a very unique locomotive consist, as it's comprised of all-EMD SD70M DC (direct current) power. On point, UP 3798 is a 2004 SD70M, one of 94 such DC-traction motor-powered units purchased by UP, with 4,000 hp. Second is UP 4079, one of 141 such SD70M DC units purchased by UP in 2000 with 4,000 hp. Third in line is UP 4340, one of 420 such SD70M DC units purchased in 2001 with 4,000 hp. This is a double-stack train with no rear units. **Finally, a note about UP 2492, one unit in a very limited and unique rebuild program supported by Union Pacific. UP 2492 is a former EMD SD60M C-truck DC 3,800 hp unit (introduced in 1984), which was upgraded in 2009. These units were resurrected for continued (and slightly cheaper) power with more eco-friendly diesel prime movers, slightly degraded in overall horsepower but compensated via more efficient software and an upgraded/appropriate diesel motor with the fewest modifications required to achieve that emissions goal. LONDON, Ont. — Electro-Motive Diesel has received 10 out-of-service Union Pacific SD60Ms for its 710ECO repowering program. Industry sources indicate they are to be designated SD59M-2s, and are being fitted with a 12N-710G3B-T2 engine. The locomotive will be rated at 3,000 traction horsepower, meaning they'll generate enough horsepower to apply 3,000 hp to actual pulling. Upgrades will include the EM2000 microprocessor and crashworthy fuel tanks. The units, sent to London at the end of 2009, are expected to be delivered to Union Pacific's Proviso Yard in Chicago this summer. Their road numbers have yet to be determined. One captured, by my video, in service.